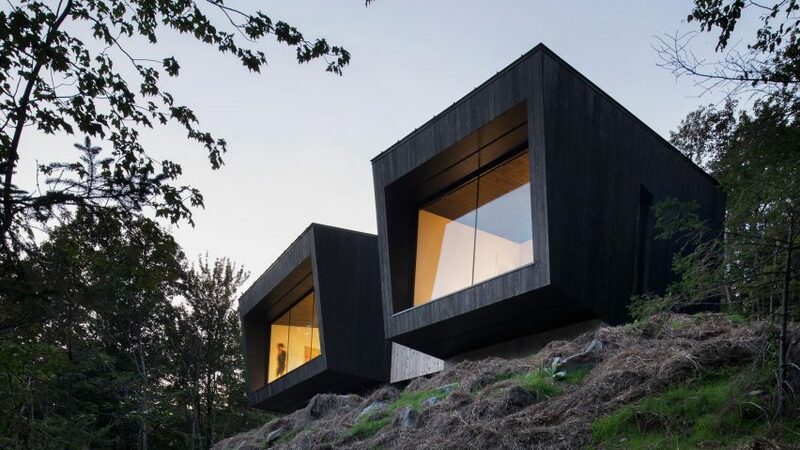 This Quebec holiday home by Canadian architecture studio Naturehumaine comprises two blackened wood cabins, which are intended to look like they are "sliding over the cliff" below. The pair of buildings make up the 888-square-foot (85-square-metre) La Binocle residence, located at the top of a forested mountain in the Eastern Townships tourist region of Quebec. Naturehumaine clad the two simple volumes in wooden panels that are charred to match hues in the surroundings. Each is set on a concrete platform, so that they teeter over the slope, and topped with black mono-pitched roofs that angle down towards the precipice. "By accompanying the natural slope of the ground, their sloping roofs reinforce the sensation of sliding over the cliff," said Naturehumaine in a project description. Large windows make the most of the elevated vantage, and are embedded deep into the angled facades to create overhangs that offer shading from strong sunlight. The blackened wood cabins are different in size, with the larger hosting an open-plan kitchen, lounge and dining room, and a bathroom. Two bedrooms occupy the other, which is angled away from its partner to face a different view. A third, smaller volume is wedged between the pair to fill the gap, and provide an entrance hall to the residence. This is clad in hemlock wooden planks to complete the "natural palette", matching the wood covering the floor of the terrace. Inside, black wooden ceiling beams and ceramic floor tiles with a concrete finish continue the monochrome material palette. The decor provides a neutral backdrop to the views of greenery offered by the large windows. "While enhancing the landscape, the project above all considers the cabin as a minimal and contemplative space, inviting tranquility," said the studio. Furnishings in the property include a grey sofa and a wooden coffee table. The dining table is made of thick wooden beams that appears to draw on the wild setting. Although following the greyscale scheme, the bathroom differs as the ceiling beams are painted white to match the wall tiles. La Binocle, which is nicknamed Crowhill Cabin, is currently available to rent on Airbnb. The project is the latest in a series that Naturehumaine has designed for the same client, who is also the builder and project contractor. The team has previously worked together on the renovation and extension of a 1920s residential building in Montreal, as well as the client's home in the city.